Address: Avenida del Jablillo, 5, Costa Teguise (Lanzarote), Islas Canarias. Located just 10 metres from El Jablillo Beach, in the heart of Costa Teguise, this apartment complex is surrounded by spacious grounds. It offers adult and children’s outdoor pools and tennis courts. Blue Sea Costa Teguise Beach apartments feature a furnished terrace, some with sea views. Lounges include satellite TV and a safe for an extra charge. There is also a kitchen and private bathroom. The property has a restaurant and a poolside bar where you can enjoy drinks and snacks on the terrace. The resort’s lively restaurants, bars and shops are 5 minutes’ walk. Free WiFi is available in the reception. Blue Sea Costa Teguise Beach offers car and bicycle rental and free public parking is available. You can drive to Arrecife in 15 minutes and Lanzarote Airport in 20 minutes. 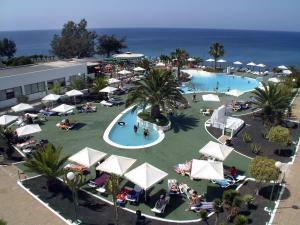 Please inform Blue Sea Apartamentos Costa Teguise Beach in advance of your expected arrival time. You can use the Special Requests box when booking, or contact the property directly with the contact details provided in your confirmation. This property will not accommodate hen, stag or similar parties. Guests are required to show a photo identification and credit card upon check-in. Please note that all Special Requests are subject to availability and additional charges may apply. When booking more than 6 rooms, different policies and additional supplements may apply.